These remarks came from Sir Alex Ferguson following Manchester United’s disappointing draw with Tottenham Hotspur on January 20 2013, concerning assistant referee Simon Beck. Arguably, this spiel could have been cherry-picked from any losing match report since the Old Trafford club won their first Premier League title – under his stewardship – in 1993 though. Firstly, I cannot remember the last time Sir Alex took responsibility himself, or blamed his team, for United’s failure to secure all three points. Although there may be some method to this madness, potentially deflecting the spotlight from any under-performing players, I would be disappointed in my own manager (Rafa, Robbie, Andre, Carlo, Guus, José, take your pick really) if they failed to acknowledge lapses of concentration from their team or alternatively a successful and well organised opposition. “We are no good at shutting up shop. Our shop never closes. It could be one of those late-night openings which costs us our position”. In contrast, you’ll notice that after a United match, the commentaries either highlight fierce criticism of an officiating mistake or as expected, a description of a run-of-the-mill closely fought win [more often than not, punctuated by a Robin van Persie brace]; never a team defeating Manchester United fairly through dangerous attacking threats and a solid back line. To illustrate this point and show Fergie’s influence on a national level, it should be noted that the Football Association issued no ban for his choice words following United’s win over Newcastle United in December. 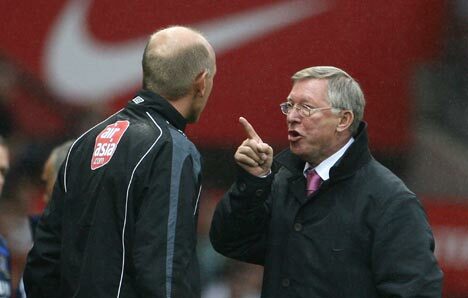 This indicated that the FA were intimidated by Alex, especially since Villa manager Paul Lambert received a one-match touchline ban having only been reported as saying “I haven’t a clue what [assistant referee Adrian Holmes] saw”, and Fergie walked free. Secondly, it is no surprise that the FA should be under the influence of Sir Alex, given his constant cries of “Wolf Wolf” in the media whenever he feels hard done by. Take the Swansea game a month back: if it were up to the United chief, centre back Ashley Williams would be facing a criminal trial for simply kicking a ball at his Dutch boy wonder. During an interview with Sky following an off-colour performance (funnily enough), the Scotsman stated that “the FA has got to look into it regardless”, piling further pressure on the governing body. The comments were deserving of a four-match ban, but it is clear from subsequent actions that Ferguson has learnt nothing in the three years that have since passed. Finally, I don’t believe it is up to Sir Alex to decide who or who isn’t “a big club”. I have to admit that I have no strong affiliation to Newcastle United, but one thing I do know is that they are not simply “a wee club from the North East”. Football is first and foremost a religion in that part of the World, similarly to Manchester, and their history or the loyalty of the Toon Army should never be degraded, as part of some personal spat with a rival manager. This is, after all, the same Sir Alex Ferguson who derided Rafa Benitez’s ‘arrogance’ when he labelled Everton a small club back in 2007. On the whole, although some of the comments above could be attributed throughout the Football Universe, Ferguson stands apart. The arrogance of United’s manager has led to a universal aversion to one of English football’s most successful clubs, and often sidelines real debate on the merits of his sides’ performances. This entry was posted in Analysis and opinion and tagged alan wiley, English football, fergie, manchester united, newcastle, premier league, referees, sir alex ferguson, The FA, tottenham by The False Nine. Bookmark the permalink. I am a united fan, and as you might imagine do not see ferguson as above the law, ALTHOUGH i can see why his comments would annoy most, he as you pointed out “potentially deflecting the spotlight from any under-performing players” does anything to protect one of his own, how i would love to have the same protection from my boss, it would certainly make me a happy worker and loyal should someone try to snap me up, there is nothing worse than having a bad day and your manager or boss having a go at you and letting everyone know that all went wrong and it´s your fault,i am of the opinion that if he has been sucessfull all these years he must be doing something right other than picking a team everyweek. You put Jose in the ( ) but he isnt going to slag his players off publicly and will also use any means necessary to protect his them. the bad decisions by the FA are like the bad decions by the refs during a season…they tend to even themselves out sooner or later for everyone. lastly i think most managers wont speak their mind because most of them are relatively new at the club and know the owners won´t put up with warnings and fines from the FA, or they are just Jose Mourinho and know they can get a great job almost anywhere.